You flip a switch and a dark room becomes bright. You plug your charger into an electrical socket and your phone zips to life. You warm up a plate of leftovers in the microwave, and you have a warm dinner. These are a few of the modern conveniences electricity provides, and if you are like me, you might have a hard time imagining life without electricity. From my visit to Ellensburg, WA I knew Washington State was involved in generating electricity from wind power, but what I didn’t know was that most of the state’s electricity is generated by hydropower. You’ve most likely heard of the Grand Coulee Dam, which is the U.S.’s largest hydroelectric producer and singer/songwriter Woodie Guthrie made famous in song. 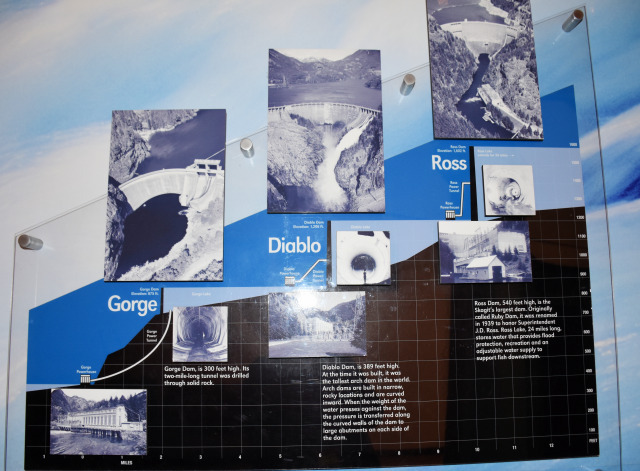 But, what about Gorge Dam, Diablo Dam and Ross Dam? 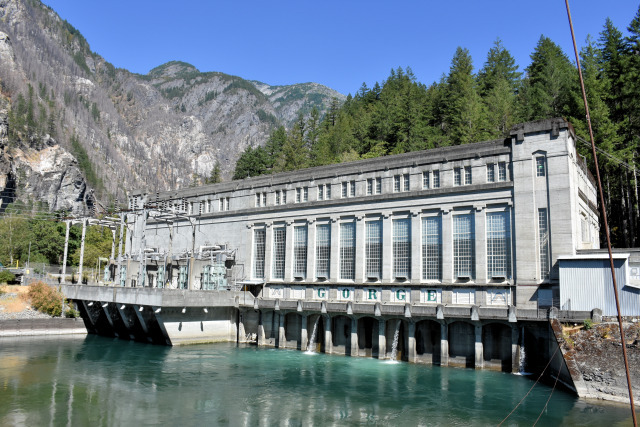 These dams are along HWY 20, one of the most scenic drives in the state that weave through the North Cascade Mountains, and they provide the city of Seattle with 20% of its electricity. 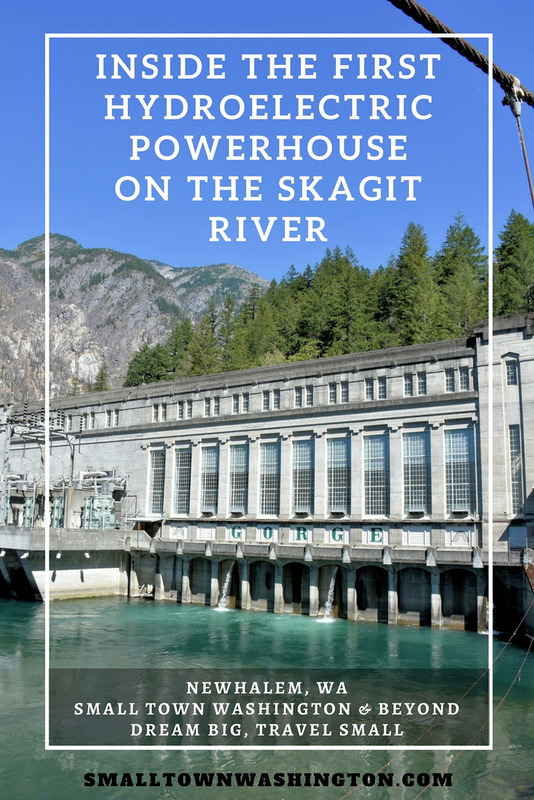 I was invited by Seattle City Light’s Skagit Tours to experience the Powerhouse Insiders Tour, which takes you inside the Gorge Powerhouse, the oldest hydroelectric powerhouse along the Skagit River. The small company town of Newhalem, a 2.5-hour drive from Seattle, is the beginning point for learning about these dams. It is here that J.D. Ross, the Father of Seattle City Light, harnessed the power of the Skagit River to provide electricity to the Emerald City. Gorge Dam was the first dam built and in 1924 the powerhouse supplied Seattle with 40% of its electricity. 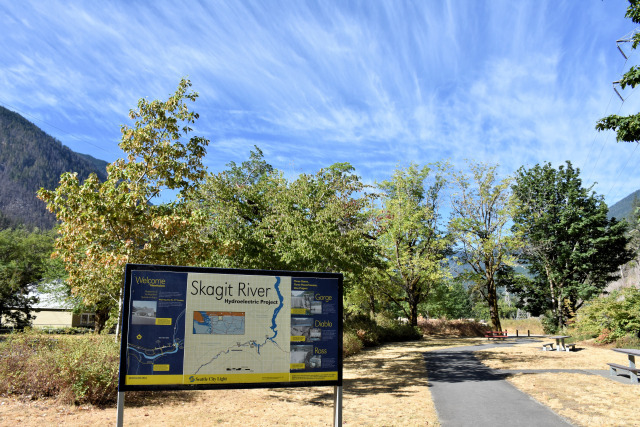 The 10 am tour starts at the Skagit Information Center in Newhalem, and at 9:45 am you check-in and get your visitors badge. The center also has information about the area and the dams. Give yourself 10-15 minutes to look through the displays. If you plan to do any hiking after the tour or do a self-guided walking tour of historic Newhalem pick up a trail map and brochure here. 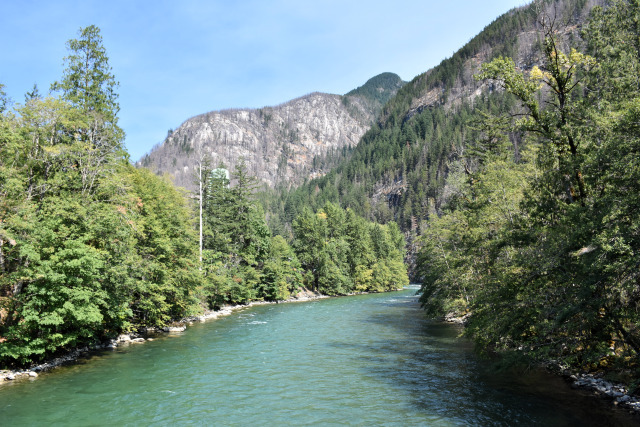 There are three dams along the Skagit River, and all can be seen as you drive along HWY 20 through the North Cascades. In front of the information center, you’ll meet your two guides (ours were Brianna and Anthony) and get an introduction to the history of the arch dams and powerhouses along the Skagit River. Some interesting facts are the intake tunnel for the Gorge Powerhouse is 2 miles long and 20feet wide. When they built the tunnel, crews started on either end and by the time they met they were only an inch off! Today, the hydroelectricity from the dams is coordinated and provide 20% of Seattle City Light’s electrical power. From there, you walk to the edge of town next to the Skagit River. The 150-mile Skagit River starts in British Columbia and ends in Puget Sound. From Newhalem westward, the Skagit River is a classified as a Wild and Scenic River. The flow of the three dams is regulated to provide favorable water conditions for spawning salmon and steelhead. The river has all five species (chum, sockeye, king, coho, and pink) of salmon and at the time of our visit, a salmon run was just beginning. In the 1920s when the first dam was built, industries were not concerned with fish spawning grounds. Later, when that did become a concern, they discovered that a natural rock slide upstream made it difficult for spawning fish to pass, so the dam had not disrupted their spawning grounds. From there you walk to the Gorge Powerhouse. There are two sections to the Gorge Powerhouse. The right side with all the windows is the original building. To the left, is the new part of the building. There are also two bridges on either side of the powerhouse, and during the tour, you’ll get to walk on both of them. Visitors can also walk the bridges and explore the nearby trails on their own. Gorge Dam is 300 feet high and 670 feet wide. When the Gorge Powerhouse opened in 1924, it provided 40% of Seattle’s electricity. Today, its generators can produce a total of 175,000 kilowatts. One of the highlights of the tour is to go into the Generator Room. 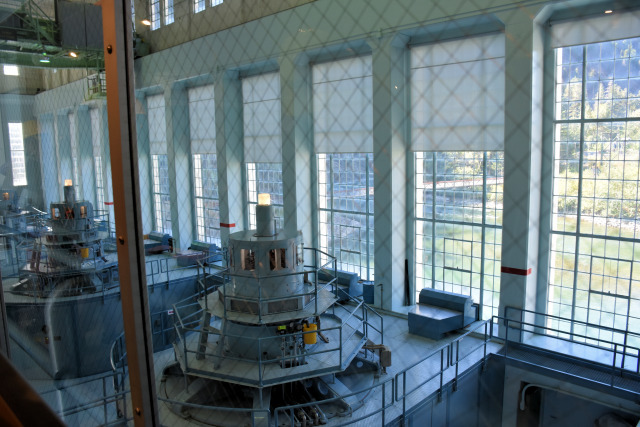 In the Gorge Powerhouse VisitorGallery, you’ll be able to spend some time looking at the interpretive displays that explain more history, and through the large windows, get to see inside generator room, and the guides explained how the electricity was generated. It’s important to note that the gallery is open to anyone, but only those on a tour get to go inside the control room, walk around generator room and see the generators up close, and go inside a turbine pit. Our guide through this portion of the tour was Jeff, a Powerhouse Operator. He showed us what the controls did, explained how the process worked and answered any questions. Getting a behind the scenes tour was fascinating, and while some of the technical explanations made my eyes glaze over, there were many wow moments like climbing up on top of the generator, being able to walk out on the balcony of the powerhouse and part of the way inside the tunnel. Fun Fact: Until the 1940s the area was only accessible by train. Throughout construction up to 300 people lived in the town of Newhalem and Diablo (further upstream). Now, less than 40 live there. I got a kick out of the picture of the Gorge Powerhouse crane lifting a locomotive train. 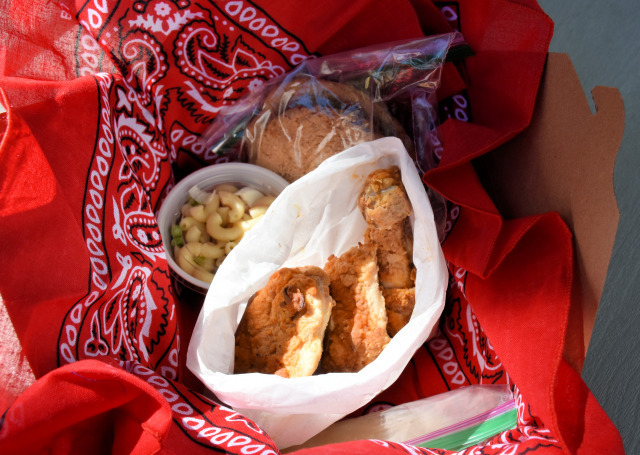 The Insiders Powerhouse Tour includes lunch and comes with cold fried chicken, pasta salad, pickles, and cookies. After seeing the gluten free option, which came with a salad and fresh fruit I wished I had requested that for lunch as I prefer those side dishes. I thought the addition of the take-home bandana was a nice touch. The tour ends around 12:45 (depends on how long you take to eat lunch), and there are plenty of things to do in the area. If you are not pressed for time, I’d suggest driving up to the Lake Diablo Lookout, as the view from there is amazing. And, on the way home, if you are hungry I’d recommend Cascadia Farms for some homemade ice cream and Birdsview Brewery for beer and hamburgers. If you have a pet, these are both great options as there is outdoor seating. My husband joined me on the tour and we both would recommend it. At $20 for an adult with lunch, we thought it was a good value. Senior price is $18 and youth price (10 to 12) is $15. We learned about the dams and powerhouses, got to see the inner workings, and ask questions. To top if of it Newhalem is in an amazing setting in the North Cascades with lots options for exploring. If you stayed or camped nearby you could easily spend a couple of days seeing all of the sights. Tours start at the end of June or beginning of July and end within the first two weeks of September. Visit their website to book a tour. 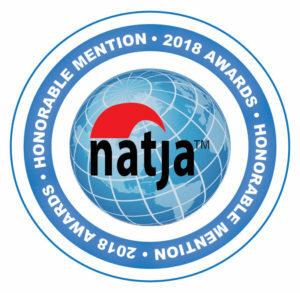 Note: As is common in the travel industry, the writer was provided with accommodations for the purpose of review. While it has not influenced this review, the writer believes in full disclosure of all potential conflicts of interest. So cool that you got a behind the scenes look at how hydroelectric power is generated in your area! So many of our nation’s dams were built in the 1920’s as part of FDR’s New Deal. They are truly marvels of engineering when you think of the technology that they lacked back then. Carrie, On the tour we learned that J.D. Ross was basically a self-taught engineer and with the tools to survey and construct it’s amazing what they did. A beautiful as well as educational tour! Cindy, The North Cascades are breathtaking. It’s nice to have a tour in such an amazing setting. I have always thought that dams are humongous structures. Interesting to tour this size of a dam plus all the scenic views around. You find all sorts of things around Washington! Carol, Ross and Diablo dams are bigger, but all the dams are arch dams, which curve. Your statement is so true about Washington, it is such a diverse state. Absolutely beautiful area. And hydroeclectric! Now, as a conservationist, I like that! I would come here for the scenery alone it’s so pretty! It’s amazing how much work goes into making sure we have the convenience of power in our homes. Jennifer, Yes, the Cascades are jaw droppers. Tours like this are really enlightening. 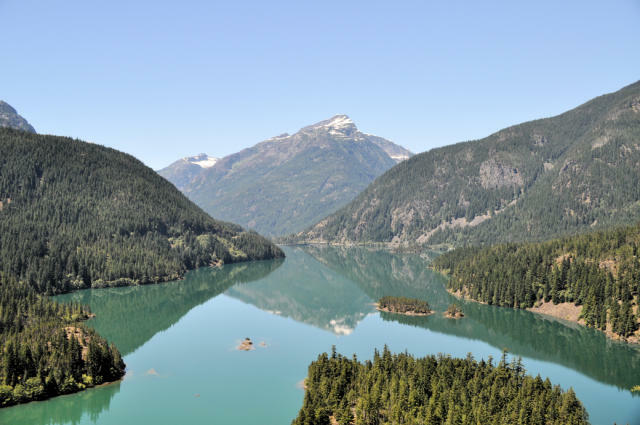 Elisa, I want to go on the Diablo Lake Tour in the spring! I think one could easily spend a few days in the area exploring the dams and hiking. The Diablo Lookout is beautiful! I always find it interesting to look at dams and see the power they have in holding water back. One of my favorites is Hoover Dam in Arizona/Nevada. However, we’ve never taken a tour of one but it must be so interesting. You sure learned a lot from your visit! Edith & Juan, The Hoover Dam is quite something! I’d love to go on a tour there if they have them. The tour was full, so I think seeing how dams work inside are of great interest to people. I hope you get the chance to tour one. I’ve never been inside one but it looks like a very interesting experience! And I love that by the end you can walk inside the tunnel! Danik, The setting is so amazing. 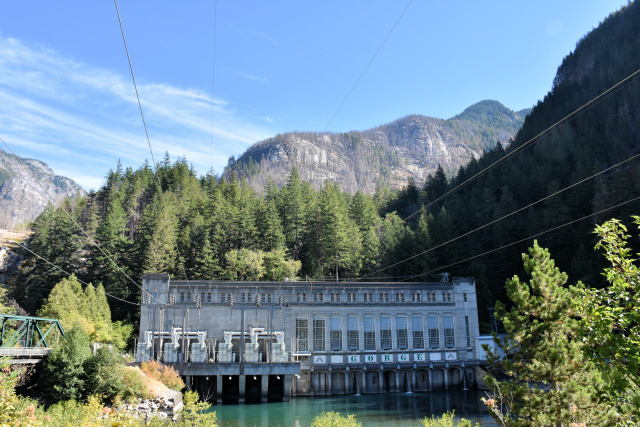 Visiting Newhalem was a big eye opener to how Washington harnessed water for electricity. Interesting trip to a powerhouse. Would have been very educative. I would surely like to go with enough time for the Lake Diablo Lookout. And of course, would not miss the homemade ice-cream. A very interesting tour that I am sure I would like. Especially as the surrounding country looks good for hiking. We take our energy supply for granted but do not realize what work went on to provide it. Nice informative post. Dave, You’d like the area for sure, lots of trails. The tour is fascinating and it’s amazing what they built making calculations all by hand. Thanks so much for commenting! I always have a fascination for Dams. The fact that dams harness the power of water is so interesting and awe inspiring. This tour of the powehouse on Skagit river is really a very thrilling one. You get to learn so much about the dynamics of Hydroelectric power and also an opportunity to enjoy the beauty of the natural landscapes. Sandy, So true. Dams are fascinating, and it was good to know this series of dams didn’t affect salmon habitat too.